I adored this series when I first read it back in the seventies, sparked by the TV series. Now its been revised with new actors for TV, and of course the books released on Kindle! Hurrah. I’ve still got my print books, a mix of new and charity shop/eBay/library rejects, but due to loss of vision can’t read such small text now, so it’s been a joy to catch up with the Poldark corner of Cornwall and it’s characters. The focus this time is on Demelza and how she’s coping with her new position as Ross’ wife. She’s just given birth to their first child and right from the start we see how she is struggling, wanting to fit in with Ross’ place in Society, but still feeling more at home with her former peers. Luckily Ross is at ease with, and respected by them. Verity, his cousin from Trenwith, proves a great help in teaching Demelza how to behave, how to dance, and with sorting out her wardrobe. Demelza comes to love her, she has such an open heart and is so upset when she learns of Verity’s failed romance. Of course she can’t help “helping” and causes a huge row from the consequences. We see too more of the villagers, the tragedy of Mark Daniels and Keren, his flirtatious wife, the mines and the miners and the sheer poverty of life then, how desperate things were for so many families when the mine Grambler closed. It really brings home how hand to mouth living was in those days. There’s snippets of the politics of the era too. Ross is trying to move forward, to make life more secure for his wife and child, and along the way doing what he can to provide work for the locals. Unlike so many in his position he understands them and has sympathies. These bring him into the public eye when he breaks out one of his employees from prison. Poor Jim Carter had gone poaching to feed his family and been caught. Sentenced to two years despite Ross effort’s he’s ill in prison, then he’s transferred to another which is even more dire and full of fever. Ross tries to help but…well, read it and you’ll see 😉 It shows just how compassionate he could be, a fair man, a moral man and so often, as with this event, that brings him on the opposite side to his peers. Its a thin line he treads, and at the end, after an awful personal tragedy he’s facing judgement from them for his actions over something else. Its a hard book to review as there’s just so much going on. It builds on what’s gone before though, and its easy to follow. Its a fascinating read, and who can’t resist Ross, especially now we’ve the vision of Aiden Turner from the TV series to mull on and swoon over!! 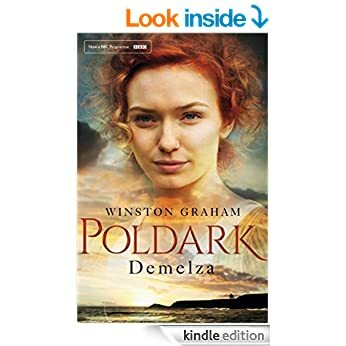 It shows us too just how changed Demelza is, how bright to be able to absorb so much learning, to adapt and try to fit in, and of course the passion between the two. They do have some huge blow-ups here, but at the heart of it is a solid enduring love. There’s some real sadness in this book, and when I first read it, ahead of the TV series ( hooked from the first episodes I had to read the first four books which were already out) I was caught by surprise and reduced to tears by one particular part. If you’re looking for a solid romance, and a story full of history, fabulous characters and realism this series is perfect. Stars: Five, another fabulous read for keeping and rereading.